Барааны дугаар 9780199684274. Categories: Dictionaries, OXFORD. 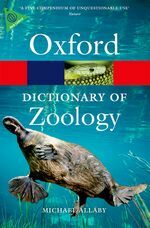 This best-selling dictionary is the most comprehensive and up to date of its kind, containing over 6,000 entries on all aspects of zoology. Complemented by numerous illustrations, it includes terms from the areas of ecology, animal behaviour, evolution, earth history, zoogeography, genetics, and physiology and provides full taxonomic coverage of arthropods, other invertebrates, fish, reptiles, amphibians, birds, and mammals. The fourth edition has been fully revised and updated and includes many new entries, for example,activational effects of hormones, aqueous humour, deprivation studies, immunization, andPsocoptera. It also features new terms from anatomy and physiology, biomechanics, neurophysiology, immunology, and evolutionary development. Recommended web links can be accessed via the Dictionary of Zoology companion website and provide valuable extra information by directing you to useful online resources and the homepages of relevant organizations. Detailed appendices include a list of endangered animals, the universal genetic code, the geologic time scale, SI units, and a taxonomic classification scheme based on the three-domain taxonomic system. Wide-ranging, authoritative, and with jargon-free definitions, this dictionary is an indispensable reference tool for students and teachers of zoology, biological sciences, and biomedical sciences, and a valuable resource for naturalists and anyone with an interest in animals. Readership : An invaluable dictionary for students of zoology and the related fields of biological and biomedical sciences. Also ideal for amateur naturalists and anyone with an interest in animals.